Area: 100 Sq.Ft. / 265Nos. Grade: 60 mm, 80 m.m..
We provide a gamut of high quality Paver Block or Concrete Paver Block. These blocks can be laid without the use of cement as the bonding material. Hence, the Blocks are easy to remove, enabling to check the ground work beneath. We are manufacturing and exporting all types of construction machinery. SG LACQUER is a transparent glossy coating for paver block. We specialize in offering various pavement solutions to our customers. 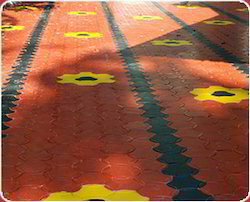 We manufacture a range of Pavement Blocks that are particularly, used for making sturdy pavements. These Pavement Blocks are highly durable and resistant to extreme heat. We offer plenty of options to our customers so that they can choose the best according to them and get optimum results. We are a unique name in the industry for manufacturing and supplying our prestigious clients an exclusive range of Rubber Mold Paver Block. 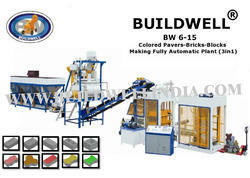 We are amongst the reputed organizations, highly engaged in offering an optimum quality range of Concrete Paver Block. Approx 40 rs to 50 rs per piece as per quality and size. These Paver Block tiles are molded with rubber and are therefore called rubber mould zigzag tiles.